Strange things are afoot in Bad City. The Iranian ghost town - home to prostitutes, junkies, pimps and other sordid souls – is a place that reeks of death and hopelessness, where a lonely vampire is stalking the town’s most unsavoury inhabitants. But when boy meets girl, an unusual love story begins to blossom…blood red. 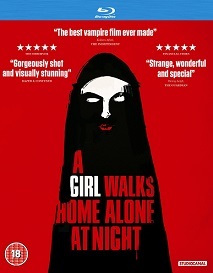 Discover an intoxicating mix of mesmerising attraction and bloodthirsty violence in this exciting and unique new take on the vampire genre with the release of A GIRL WALKS HOME ALONE AT NIGHT.